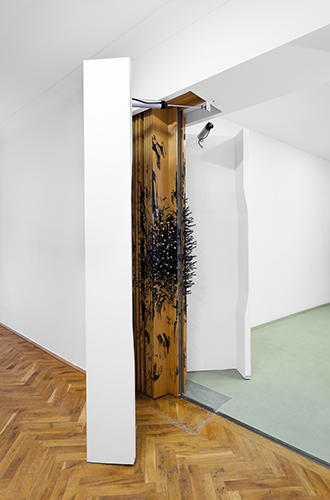 In 1996, German artist Guenther Uecker installed one of his nail-works at Kunsthaus Dresden with which he permanently opened a folding door to the office of the director at this time. The work was ment to stay there, thus would be part of every subsequent exhibition. In 1998, German artist Eberhard Bosslet hid Uecker's work with his own installation »Verblendung« behind plaster board, making his work a permanent installation, too. Since that year, Uecker's nail-work could be seen only once again for 3 months in 2007. After that, the director of the exhibition space decided to hide it again behind plaster boards. 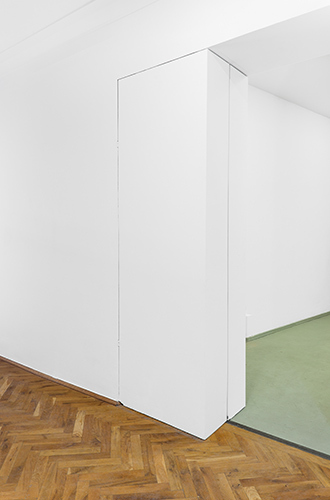 In 2011 Stefan Eichhorn dug out Uecker's work, exchanging the plaster board walls with a wooden double door. The doors were opened and closed with two timed engines, showing the artwork every 5 minutes.